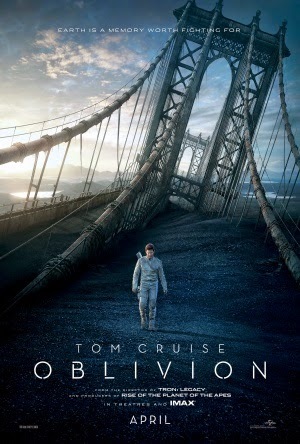 A unique blockbuster with no renowned source material behind its premise, Oblivion is a film combining romance, action and thriller into a sci-fi carapace staged in a post apocalyptic Earth. With civilisation brought to its end and forced to flee the planet, technician Jack Harper (Tom Cruise) and Victoria Olsen (Andrea Riseborough) remain stationed on the ruined homeworld to salvage the remaining water reserves and spearhead a future for humanity on Titan, Saturn's largest moon. The narrative fluctuates dramatically we we press into the backstory of the war that destroyed Earth, leaving the new equilibrium completely polarized in comparison to how the film started. This transition through such major twists is good in theory; but not in execution. Poor exposition and a lack of focus will drive audiences into, excuse me, obl-no, I wont say it. But you get the point. With an enormous $120 million budget, Oblivion crafts a vision of Earth destroyed by war primarily with synthetic effects. Everything is beautifully rendered and fits nicely alongside the expansive real world locations, providing a spectacularly grey and bleak image for the settings. The cinematography emphasizes these effects with sweeping establishing and panning shots, and a polished art direction makes it more than just a landscape of mountains and dirt. Iconic human locations are blended into the world, derelict and broken, to humanize and add a tragic element to the mise en scene. The visuals are complimented by a beautiful if insanely loud soundtrack, which adds tension and adrenaline to every scene. Strong performances across the board provide more scaffolding to the flimsy narrative. Tom Cruise is likeable and relatable in his internal struggles as the plot twists unfold, and although Morgan Freeman (yeah, he's in this movie) has a weak character, he portrays it with some deal of finesse. Unfortunately, the characters outside of Jack Harper are treated carelessly and have little to no development to rival the protagonist. While this helps to not distract us from the hero, it ultimately makes the film feel thinly plotted and poorly paced. Oblivion has a superb story - it just can't tell it properly. The twists are treated as insignificant plot points that never truly come to fruition; yet the film carries on anyway, leaving the audience trailing behind without a clue of what's going on. It suffers the polar opposite of Inception syndrome - rather than having to spend thousands of years explaining the complex plot points, it just doesn't. This weak attention to its own narrative and characters is a huge setback and disappointment when the special effects and premise do so much to impress. An enjoyable film that would've benefited massively with some rewrites.